As I’ve talked about a lot here recently, my favorite ‘outfit’ for the iPad 2 is the Apple Smart Cover and a skin for the back. My favorites so far have been a gelaskin and the ZAGG LEATHERskin for iPad 2. 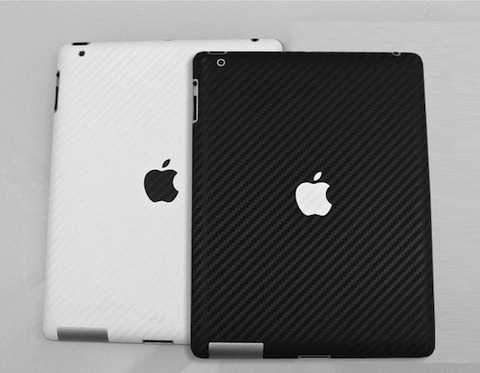 I have to say these Carbon Fiber Skins for the iPad 2 from BelchCo (shown above) look very good to me too. BelchCo Carbon Fiber Skins for the iPad 2 are a perfect compliment to the New Apple iPad 2. These carbon fiber skins are beautiful, durable and ultrathin. Made out of the highest quality carbon fiber 3M DI-NOC vinyl and cut entirely in the USA, your Belch Co carbon fiber skins will not disappoint. They come in black and white, and with or without the Apple logo cutout – and they’re priced at an attractive $18.99 for the back skin only. I’ve got a review sample on the way, so I’ll have more thoughts soon. Do NOT order anything from these clowns. They take your money and . . . nothing. They don’t respond to emails or ship the item you paid for. I should have done a quick Google search on them before I gave them my money. Similar stories to mine. I was forced to file a Paypal dispute to try and recover the money I gave them. Buyer BEWARE.